This is a story for anyone who has laid in bed at night and wondering if they were just a little bit paranoid or if there really is something else going on they don’t quite understand. Miranda Prompts us to consider a number of questions. Do any of the countless conspiracy theories have even a sliver of validity, or is every such worry for nothing? Have powerful families or a conglomerate of huge corporations or governments or some combination of two or even all three of these managed to establish a shadowy global means of controlling us? In this tale we follow the lives five people who are connected to Miranda, a global organization that has existed in secret for many generations. The world knows nothing of this cabal, though it exercises a great deal of control over anything of significance that happens in the world. Those at the top of Miranda are unknown to the world, and yet they are more powerful than any president, king or prime minister. Porter, Leslie, James, Ramone and Jacob, all affiliated with Miranda; purposefully placed on a cruise ship with different agendas. Do they trust each other or not? Would doing so play into Miranda’s plans or would it thwart them? Matching wits against this mysterious organization is seldom successful and often fatal. Should they trust Miranda, or is it time to run for their lives? 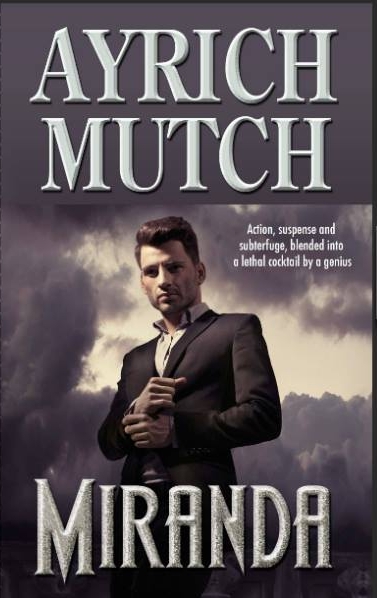 With our collective concerns about drones, government monitoring of our electronic communication and the trade off of privacy for convenience, Mutch pulls us deep into this tangled web. When we finally finish reading this intense story, we realize that on this topic, the line between fiction and reality is probably not so crisp and tidy. In many novels we get to the end and breathe a sigh of relief. In Miranda we get to the end, look around and give a bit of a shudder.